A week ago, I was lucky enough to receive these great Gap photos and commentary from Miss Yaya of I Will Be My Own Judge. But I couldn't resist judging her comments and giving them an A+. It's refreshing to have a new pair of critical eyes trying on clothes for 34th Street. Thanks, Miss Yaya! And be sure to check out her blog for comprehensive makeup reviews and Magazine Weekend picks. "I had this green shirt from a Gap shopping trip last week, but I took a pic anyway because it's the new collection - the collar is funky and the color is bright and perfect, but it wrinkles so fast and what the heck do I do with the strings in the middle?" I adore this color on Miss Yaya with her striking hair. Hmm, but the strings do hang kind of limp and wrinkles? Annoying. 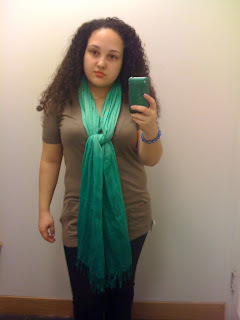 "The scarf and cardi are so perfect I wanted to keep them forever (I bought them...)"
Beautiful. I love the neutral with the green ombre. 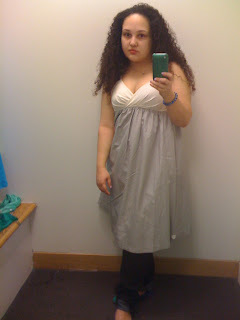 "This is not meant for mere humans - this is meant for preggo humans as the bottom of this dress has a mind of its own." Hallelujah, Yaya. Us preggos are not mere humans, we're high-heel-addicted humans who wake up one day and, tragically, opt for sensible, low-heeled slip-ons. 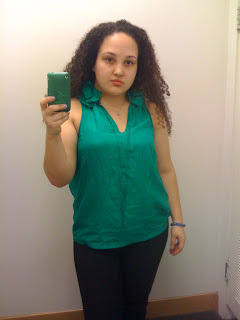 "It looked better unbuttoned and rolled up but not enough to buy. 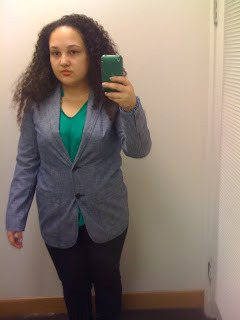 This blazer looked so horribly wrong on me but so terribly right on the mannequin." "One of the two items I would like to buy - this dress is soft and bright and...happy :)"
So bright and happy. 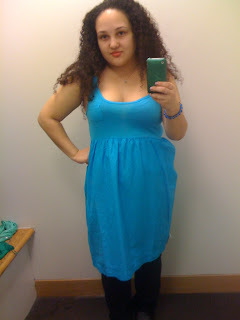 I really hope you bought this dress, Miss Yaya, because it is adorable on you. The blue dress comes in a bunch of different colors but I think the shade she picked out is one of the best. There was a nice purple too, just not in my size at the big 42nd street store. Sounds like I need a trip to 34th street! 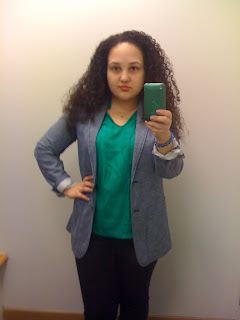 like the green w/ the blazer! I"m distracted by her amazing, beautiful hair! Oooh, Miss Yaya is awesome Miss Fashion! No one shall ever reach your level in this area, but she is a great stand-in! She is spot-on about those ties, what is one to do with them? The scarf is outstanding with her hair, it looks beautiful, and the "Us preggos are not mere humans" is too funny! You'll be strolling down the street once again in those heels, yeppers, we are pretty sure you will be! Sending you a hug and a smile!